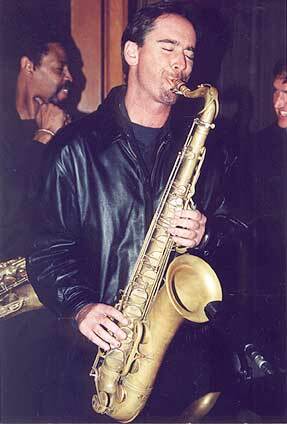 I began my own devotion to studying music, especially jazz, at the age of sixteen. In 1978 when I was ready to go to college, there were virtually no jazz courses or jazz programs in the universities or community colleges anywhere. I feel very fortunate that I found and was accepted by the Berklee College of Music in Boston where I was exposed to world-class teachers and performers, an international student body, and an environment of serious dedication to musical growth. Later, as a graduate student and teaching assistant at Rutgers I was given the opportunity to work closely with some of the great musicians of jazz. The intensity and quality of my east coast education (Berklee and Rutgers both) has given me a strong and rich foundation from which to develop my musical voice and personality. Over the past 20 years I have been an active and productive member of the jazz communities of San Diego, New York/New Jersey, Boston, and now the San Francisco Bay Area. I have produced 4 CDs as a leader or co-leader featuring my original jazz and Latin jazz compositions, and as a side-man have performed with some of the great names in jazz. In addition, I have been a member of bands playing blues, salsa, Brazilian, rock, pop and ethnic music with musicians from Cuba, Puerto Rico, Venezuela, Guatemala, Peru, Brazil, Mexico, Europe, Canada and the U.S. The quality of my education and my continual professional activity have provided my students with a rich resource for their own musical growth and inspiration. Unlike some professional musicians, I really enjoy teaching, and have been involved in a variety of educational settings, including private arts schools (elementary through high school), community colleges, universities and private home instruction. I have taught jazz ensembles, jazz combos, jazz improvisation and jazz theory classes, as well as group and private woodwind lessons, and college bands. My students have gone on to become students at Berklee, the New School, USC, Indiana University, and other college music programs. What I find so interesting and satisfying about teaching is being a part of the process by which students discover their own musical personality. I have found that providing a safe, inclusive, engaging, fun and challenging environment has allowed my students to explore their creative potential and discover the meaning that music holds for them in their lives. Music transcends all boundaries of language, culture, economic background, race, nationality and even academic ability. I have a very deep belief that music is for all people who seek it, and through my teaching and performing have experienced music's unique ability to bring people together. Music allows people to experience their connectedness to each other while at the same time becoming more connected to their own creative processes. Jazz improvisation in particular challenges students to discover and experience their personal relationship with musical meaning and expression. To talk to me, use my contact form.